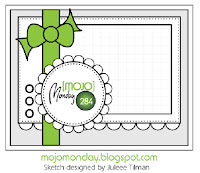 Playing with another weekly sketch challenge from Mojo Monday. Wanted to get another card in with our WONDERFUL Sale-a-brations DSP and Ribbon before they are gone (Sale-a-brations ends 3/22/13). 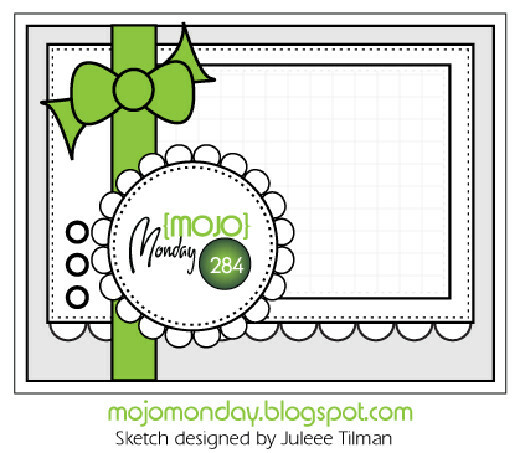 I think my ladies attending my workshops this weekend will like making this card!! Enjoy!! Accessories: Sycamore Street Ribbon (Sale-a-brations), 1" circle Punch, Pearls, Large Pearls, Delicate Details Lace Tape, and Snips.